While the bread was baking, the whole house was filled with the aroma of basil. My neighbour smelt basil all the way near the lift of our floor. She came to check what was cooking. Remember in my last post I mentioned that I made some pesto, well I used it to make some delicious bread which I wanted to bake for such a long time. Using biga to make the bread was the other temptation. Using biga makes the bread more flavourful. It gives more strength to weak flour. So the plain flour that we get in Kenya and India is quite weak compared to the ones available in the western countries. Its also amazing how two pinches of yeast can ferment a whole loaf of bread. Biga is the Italian word for preferment. Traditionally, bakers use a bit of the previous fermented dough to make a new batch. At home its easier to mix flour, water and a pinch of yeast to start the biga.The biga should appear wet and sticky. The biga is left covered with cling film at room temperature for 6 to 24 hours. I usually leave it overnight. Biga can be stored in the refrigerator for 5 days. Remove from the fridge and leave it outside till it reaches room temperature. Biga can be frozen. To use it remove from the freezer and leave it at room temperature for 3 hours or until it is active and bubbly again. Usually the biga should be triple the original size.Other common names used are poolish (French), sponge, starter or simply preferment.Other flours can be used to make the preferment like rye, wholewheat, spelt, etc. 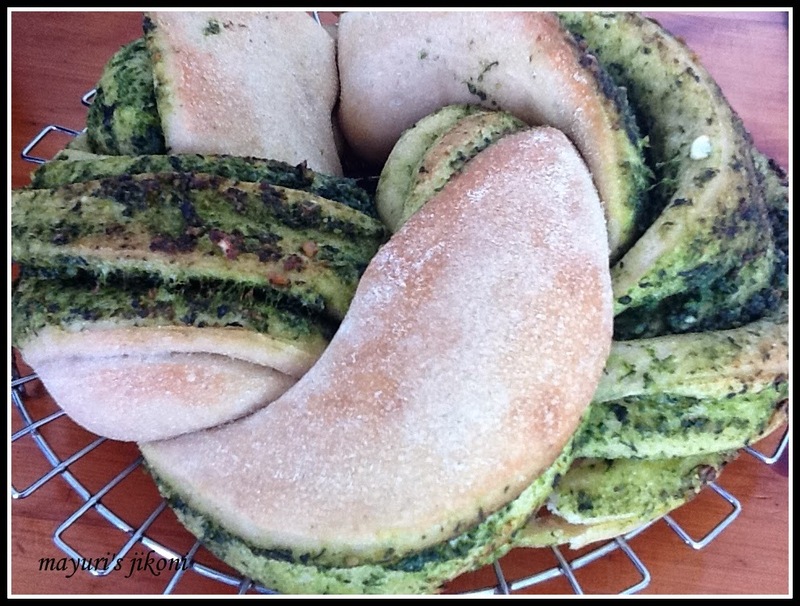 So here is the recipe for the braided pesto bread and the pesto. Chop up the basil leaves roughly. Add the leaves, garlic and pine nuts into a food processor. Process the mixture to a smooth or rough paste. Remove the paste into a bowl. Add salt, oil and cheese and mix it well. Mix flour, water and yeast with a wooden spoon. Pour it into an oiled container. Wrap it with cling film and let it ferment for 12 to 16 hours. Sift both the flours, salt, sugar and yeast together. Mix water and milk together. Add water and form a dough. Knead the dough for 10 to 15 minutes till it is smooth and silky. Can use a dough machine to knead the dough if you like. Form the dough into a ball and rub oil over it. Grease a bowl with oil and place the dough in it. Cover with cling film and let it ferment in a warm place till it is double the size. This will take about 1½ – 2 hours. Knead the dough gently. Dust a board or worktop with flour. Roll the dough into a rectangle of about 12 X14 inches. Spread the pesto sauce all over it. Roll the dough from the widest part into a swiss roll. Pinch the seam to close completely. Place the rolled dough on a greased baking tray. Using a sharp knife or steel spatula, cut the roll into half lengthwise. Form a braid using the two parts. Leave it as a long braid or shape it into a wreath. Place the dough into the oven to bake for 20 to 25 minutes or until the top is golden brown. Remove the bread from the oven and place it on a wire rack to cool. Serve it with yummy soup or have it just the way it is. The biga will be glutinous. Try and break it into smaller portions and add to the flour. If you find some of it is stuck to the container, add flour and rub it. Add to the main flour. If your pesto sauce has lots of olive oil, strain it out. When you cut the bread, you don’t the baking tray to be flooded with oil. Add the flavoured oil to dough for parathas, rotis, bread or pasta. Sprinkle the bread with more parmesan cheese before baking if you like. What a lovely loaf! No wonder your neighbor came looking! Thanks for linking it to Healthy Diet event! Looks healthy and yummy loaf…… Lots of variations! !